We all love hand making for the holidays, and each Friday from now through the end of the year we are sharing some of our favorite seasonal sewing projects – from decorations to brighten your home to projects that make great gifts. This week we’re sharing some of our favorite projects to dress up your holiday table! One of the easiest ways to make a holiday meal or party exceptional is to create an unforgettable table setting. Add just one handmade touch to your table, or make everything yourself from the tablecloth right down to holiday-themed fabric napkins with these table decorating tutorials! 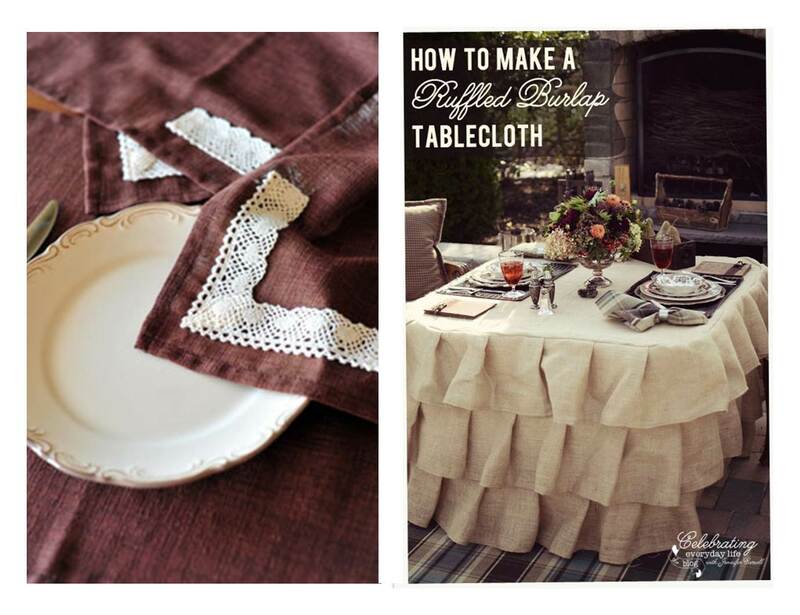 Make this simple tablecloth pictured on the left with the How to Decorate Your Thanksgiving Table with Homemade Tablecloths from Dummies.com, or follow Jennifer’s tutorial to make the fancy Ruffled Burlap Tablecloth on the right. 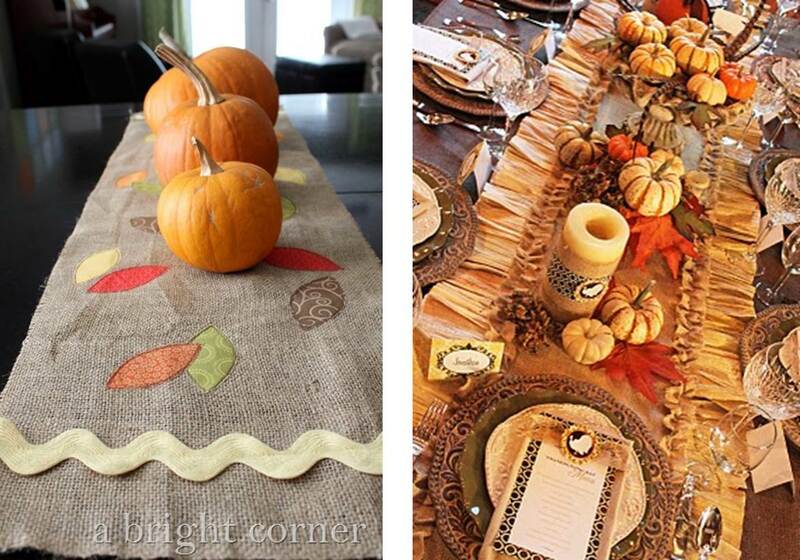 Create this simple table runner on the left with fall leaves with this Fallen Leaves Table Runner Tutorial from A Bright Corner, or sew a stunning Thanksgiving Burlap and Corn Husk Table Runner like the one pictured on the right from Amanda’s Parties. 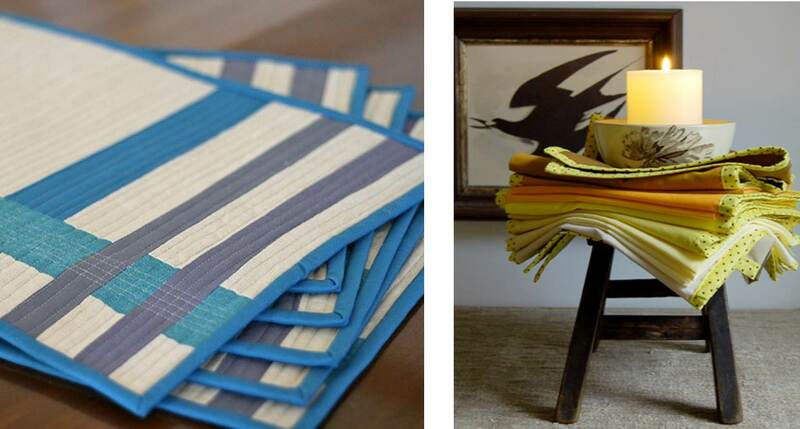 Use Holiday colors or themed fabric to create simple placemats for your table with this free downloadable Placemat Pattern and Tutorial from Handmade by Alissa, and make sure that you have enough fabric to make matching fabric napkins using Molly’s Handmade Napkin tutorial from The Purl Bee. 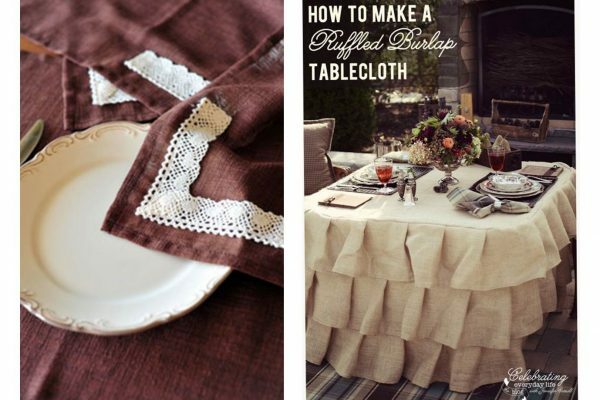 Use fall or winter colored fabrics to create either a bouquet or leaves and flowers to scatter around the table. Mollie Makes offers a free downloadable project for making fabric fall leaves from The Button Jar, and get the fabric flower how-to from Dana at 14 Days of Love. Make special decorations for your home or for each of your guests with the Fabric Pumpkin Tutorial from Craft Buds, or these adorable Scrappy Fabric Turkeys from Diary of a Crafty Lady. 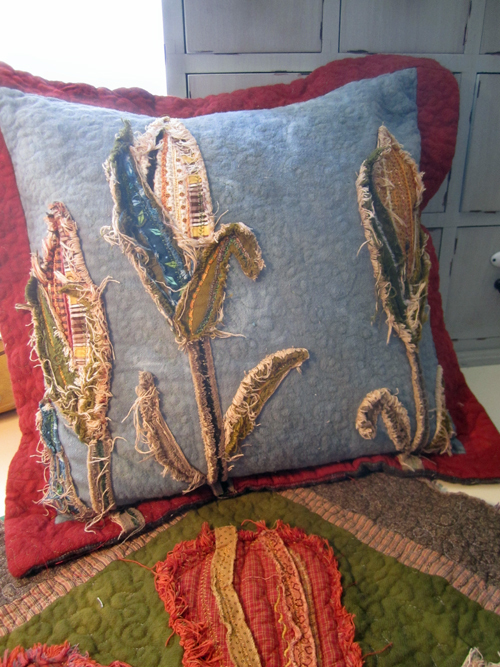 Learn how to make “raggy” edged applique from Miriam Rawson. Use this technique to create not only pillows, but placemats or table runners for your holiday feast. For even MORE ideas for decorating this holiday season, see our other holiday table decorating ideas here, and follow our BERNINA WeAllSew Pinterest Handmade Harvest Décor board – happy decorating! Next Next post: Did you make it to the International Quilt Festival in Houston this year?